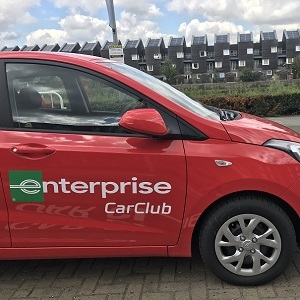 Barking Riverside London has teamed up with Enterprise Car Club to provide on-site vehicles for local residents and businesses as well as new residents moving in next year; who are looking for quick, low-cost and easy access to a vehicle at any time. Located next to the River Thames in East London, Barking Riverside is one of the largest brownfield development projects in Europe. The new development will include 10,800 new homes, a new London Overground station, as well as seven schools and 65,000 sq. ft. of commercial and cultural offerings. More than 1,000 homes on the site have already been completed, with 378 homes currently under construction. The first phase of new homes, Parklands, will launch later this year through L&Q. The Barking Riverside Car Club will benefit many residents and visitors who may not own or have access to a car making the car club an essential aspect of integrated transport in the area. Car clubs are a viable and cost-effective option for those who don’t have access to a vehicle and need one either for short or long journeys. Two Enterprise Car Club vehicles, a Vauxhall Adam and a Hyundai I10, will be based in dedicated on-street bays on the site from September, with plans to expand the programme in the future. Each resident will receive a free one-year membership to the service as well as £50 worth of car club vehicle rentals, and for a limited time their day rate will be capped at £25 per day. This forms a key element of the project’s sustainable transport ecosystem, providing local people with modern, low-emission cars that they can hire by the hour and without needing to find parking. Barking Riverside is London’s only Healthy New Town, designed to promote health, wellbeing and independence through integrated local services. Dan Gursel, Managing Director of Enterprise Car Club, adds: “Barking Riverside is a very significant opportunity for developing car club usage in the capital, as it’s a large location that will attract many new residents, businesses and visitors. Located nearby, the Barking branch of Enterprise Rent-A-Car provides additional access to a much wider range of mobility for people and businesses in the area. Vehicles including hatchbacks, vans and even executive and luxury cars are available for longer journeys and customers with alternative vehicle requirements. Enterprise Car Club uses the latest website and mobile technology to deliver a convenient and user-friendly automated rental process. People can quickly apply for membership and then book vehicles within a few hours. Vehicles cost from £4.95 per hour to rent, including petrol and insurance, and from £39.95 per day for members needing a vehicle for more than eight hours. In addition to the vehicles located at Barking Riverside, members can immediately access the wider Enterprise Car Club network of 1,100 on street vehicles located in 30 major towns and cities across the UK. Many of these vehicles are based at mainline stations and other transport hubs, helping to create a more convenient and joined-up service. The Enterprise Car Club fleet offers highly sustainable and low-emission motoring. Many of the vehicles feature hybrid and electric technology, enabling members to try these new technologies at low cost.